In this political cartoon, the leaders of both political parties, James Garfield of the Republicans and Winfield S. Hancock of the Democrats, squeeze the innocent Chinese immigrant between their political platforms. Because Chinese immigrants and American-born Chinese were barred from obtaining citizenship, they could not vote. Since they could not vote, neither political party took any interest in their deplorable plight, as the cartoonist suggests. 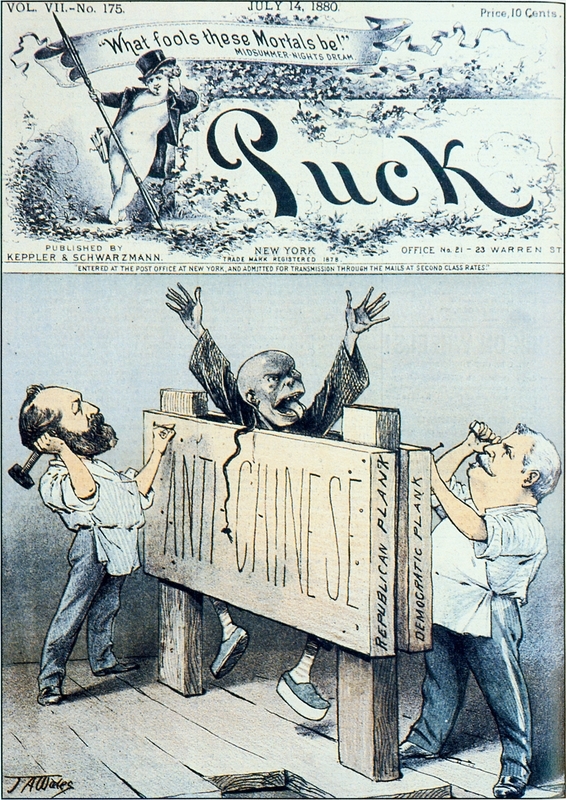 The racist stereotypical caricature of the Chinese immigrant was typical of the period, even in cartoons that were sympathetic to his problems. Cite This document | J.A. Wales, “The Chinese Immigrant is Squeezed by Both Parties,” HERB: Resources for Teachers, accessed April 22, 2019, https://herb.ashp.cuny.edu/items/show/652.